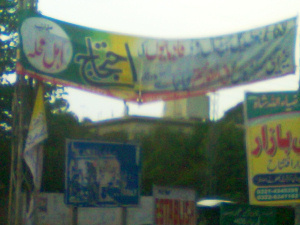 RAWALPINDI — It seems that city administration is waiting for occurrence of some untoward incident against Ahmadi community, as despite passage of several days the administration has not removed a number of banners demanding end to religious activities of the community on every Friday in a house located in E-block of Satellite Town. The banners are displayed by some “action committee” which wants an immediate end to religious gatherings of the community people at their worship place. As, according to them, the security measures taken by police as well as administration of the worship place are bothersome for the residents of the area. A resident of the area, whose house is located few yards away from the worship place of Ahmadis, when interviewed, said that these banners were leaving a bad image on the hearts and minds of his schoolchildren. He said, though a link road in front of the worship place is closed down for every kind of movement for one hour on every Friday, it never created trouble for them. He said such banners were a source of distress for them more than the activities of Ahmadis. He also said that those who were hanging banners in the area mentioning “area residents” on them were not at all living in the area. He also criticised the administration of the city for not removing at earliest all such stuff from the streets and roads of the area that were creating hatred for the minority. When contacted, one of the members of the administration of worship place of Ahmadis, termed such banners a conspiracy and a source of great danger for the community. Wishing not to be named, he said the banners were getting the attention of more and more people with each passing day and it was alarming. “We are frightened of being targeted on this baseless propaganda. It is like playing with the emotions of minority that is already facing a social boycott like situation in the country,” he added. He also argued that people behind this activity were of the view that Ahmadis were using a residential building for worship place but it is a matter of fact that hundreds of residential units across the city were converted into mosques. He said if something wrong occurred or someone tried to attack their worship place in the area, the administration of the city would be responsible for that. He said the community was not doing anything unconstitutional, as inscribed on the banners. The building belongs to Jamaat-e-Ahmadiyya, a registered organisation, he added. DCO Rawalpindi Saqib Zafar did not respond to several calls made by this scribe for his comments on the issue.